From a block away you could hear the shrieks of inmates being beaten for hiding food. The workers around Shmerke reached into their clothing. Potatoes, bread, vegetables, and pieces of firewood rolled into the street. They hissed at Shmerke, his puffed-up body obvious. . . . “Dump it. Dump it!” But Shmerke wouldn’t unload. In a secret bunker deep beneath the ghetto, a stone-floored cavern excavated from the damp soil, metal canisters were stuffed with books, manuscripts, documents, theater memorabilia, and religious artifacts. Later that night, Shmerke added his treasures to the desperate depository. Before resealing the hidden doorway into the treasure room, he bade farewell to the Torah covers and old rarities with a loving caress, as if they were his children. “In the Strashun Library,” a postcard from the “Vilner yidishe geto” (Vilna Jewish Ghetto) series by Ber Zalkind, ca. 1923. Kaczerginski was one of a group of ghetto residents who risked their lives to save the legacy of Jewish culture from Nazi plunder. 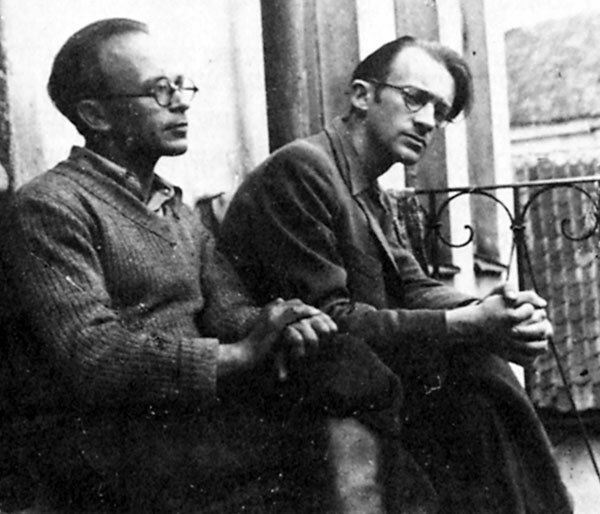 It also included the linguist Zelig Kalmanovitch, who underwent a religious awakening during the war and became known as “the prophet of the Vilna ghetto”; Herman Kruk, who arrived as a refugee fleeing Warsaw and headed the ghetto library; the high school teacher Rachela Krinsky, who became Kaczerginki’s lover; and the great Yiddish poet Abraham Sutzkever. Close friends and members of the literary group Young Vilna in the 1930s, Kaczerginski and Sutzkever organized what came to be known as the paper brigade. An aesthete with a belief that literature possessed an almost supernatural power, Sutzkever composed powerful poems in the midst of the Holocaust in the faith that he could cheat death as long as he continued to create. Yet it is not the refined Sutzkever who is Fishman’s hero but the colorful, earthy Kaczerginski. A true folksmentsh (man of the people), Kaczerginski was a communist who had led a hardscrabble existence, but his lively, outgoing personality won him friends from all walks of life. His poems, less innovative and more tuneful than Sutzkever’s, were often set to music. Many became popular in the Vilna Ghetto and are still sung today. At the outbreak of World War II Vilna had enjoyed a period of relative calm under Lithuanian and then Soviet rule, so many residents hoped that Vilna could ride out the war unscathed. But within six months of the arrival of the German army on June 22, 1941, over half of the city’s Jews had been shot and buried in mass graves at Ponar on Vilna’s outskirts. Living Jews were not the Nazis’ only target. 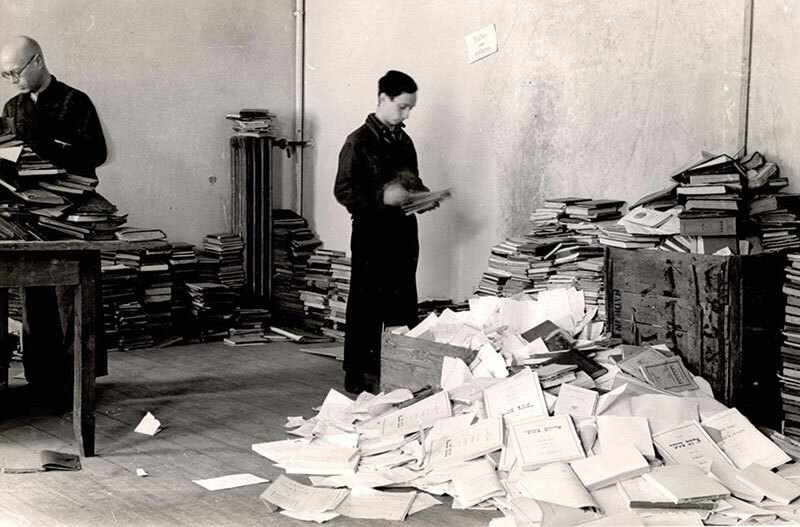 A mere week after the initial Nazi foray into Vilna a member of the Einsatzstab Reichsleiter Rosenberg (ERR), the Nazi agency in charge of looting cultural property in occupied territory, arrived to survey local libraries, museums, and art collections. Vilna, which was known as “the Jerusalem of Lithuania,” was a special prize. Its legendary status as a center of Jewish learning was symbolized by two great institutions. The Strashun Library stood in the heart of the traditional Jewish quarter and was famous for its collection of rabbinic works. In a newer part of the city stood the Yidisher visnshaftlekher institut (Yiddish Scientific Institute, known by its acronym YIVO), the first center for Yiddish scholarship, which was rooted in a secular vision of the Jewish people as a modern nation. 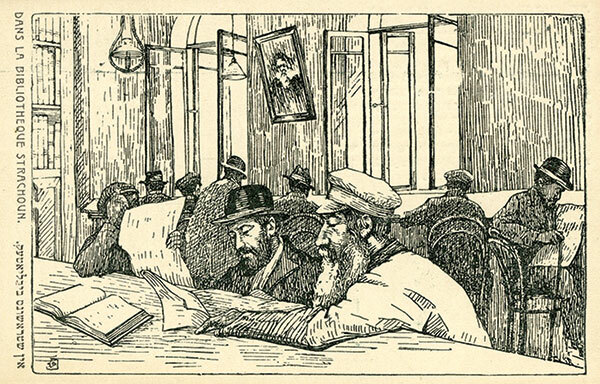 Since that nation lacked a state of its own, the YIVO headquarters became an international symbol for Yiddish-speaking Jews, the equivalent of a national language academy, university, and library rolled into one. Kruk, the librarian, shuddered as he recorded the moment when the book dumping began, in early June 1942: “The Jewish laborers who are engaged in this work are literally in tears. Your heart breaks just looking at the scene.” As someone who had built libraries, first in Warsaw and then in the Vilna ghetto, he recognized the full magnitude of the crime that was unfolding. Most of us are aware of the Holocaust as the greatest genocide in history. . . . But few of us think of the Holocaust as an act of cultural plunder and destruction. The Nazis sought not only to murder the Jews but also to obliterate their culture. They sent millions of Jewish books, manuscripts, and works of art to incinerators and garbage dumps. And they transported hundreds of thousands of cultural treasures to specialized libraries and institutes in Germany, in order to study the race they hoped to exterminate. In his memoirs, he recounted a folktale: When the Lord created the first Jew, the biblical patriarch Abraham, the Almighty gave him two presents for his life journey—a book, which Abraham held in one hand, and a sword, which he held in the other. But the patriarch became so fascinated reading the book that he didn’t notice how the sword slipped out of his hand. Ever since that moment, the Jews have been the people of the book. It was left to the ghetto fighters and partisans to discover the lost sword and pick it up. Ancient thoughts—in the letters that melted hot. Boiled, flooded together, in the foundry pot. Must now explode the whole world with a shot! The existential statement was that literature and culture were ultimate values . . . Since they were sure they would soon die, they chose to connect their remaining lives, and if necessary their deaths, with the things that truly mattered. . . . The book smugglers were also expressing their faith that there would be a Jewish people after the war, which would need to repossess its cultural treasures. . . . Finally, as proud citizens of Jewish Vilna, the members of the paper brigade believed that the very essence of their community lay in its books and documents. If volumes from the Strashun Library, documents from YIVO, and manuscripts from the An-ski Museum were saved, the spirit of the Jerusalem of Lithuania would live on, even if its Jews would perish. Caught in the Nazi death trap, these individuals dedicated themselves to a source of transcendent meaning as human beings, as Jews, and as natives of Vilna: the written word. There was hope that however many Jewish souls were exterminated, the Jewish people would endure and that this sheyres-hapleyte (surviving remnant) would take up the preserved fragments of its culture. It was this hope that accompanied the surviving members of the paper brigade as they returned to Vilna after liberation, Sutzkever from Moscow (his literary talents were so renowned that Soviet authorities sent a military aircraft to transport him and his wife from the forests of Lithuania to safety in Moscow in 1944) and Kaczerginski from a Soviet partisan unit in the nearby forests. On July 26, 1944, a mere 13 days after Vilna’s liberation, Kaczerginski, Sutzkever, and Kovner established a Jewish museum to house the recovered remnants of the city’s Jewish heritage (the YIVO building and all the material hidden within it had been destroyed). They also set out to collect documents generated in the ghetto by its Jewish inmates and German rulers, as well as some of the very first survivor testimonies. This work arose from yet another goal: to now hold the Nazi tormentors accountable for their actions. Shmerke, Sutzkever, and Kovner conceived of the museum as a continuation of both the paper brigade and the FPO. . . . [They] intended to use different types of material (the ghetto archive, Gestapo archive, and survivor testimony) to ensure that murderers would be brought to justice and punished. They saw the Jewish Museum as a framework for continuing the battle against the German murderers and their local collaborators, with trials and evidence instead of guns and landmines. When Sutzkever was invited to testify at the Nuremburg trials as a witness of Jewish persecution, he read a German document found in the Vilna Ghetto into the court record. It was the first time such evidence had been submitted by a victim of Nazi crimes. Across the city, precious Venice imprints, manuscripts, and unique items are being ripped apart, trampled upon, and used to heat ovens, and we are not given the opportunity to save these treasures. For two years, we risked our lives to hide them from the Germans, and now, in the Soviet Union, they are being destroyed. . . . Sutzkever and I have had dozens of meetings with ministers, the Central Committee of the Communist Party, and other important persons. They all promise, but no one helps. First Sutzkever and more slowly the communist-leaning Kaczerginski came to realize that they had to rescue these materials once again, this time from the Soviet regime. They began clandestinely handing over packages to various emissaries headed to New York, where YIVO had relocated in 1940. When they themselves finally emigrated they smuggled along what they could via Poland, Prague, and Paris. Now guilty of the theft of Soviet property, they did their best to cover their tracks. Here Fishman’s research particularly shines, though the tangled tale of how these packages made it out from behind the Iron Curtain will never be fully unraveled. 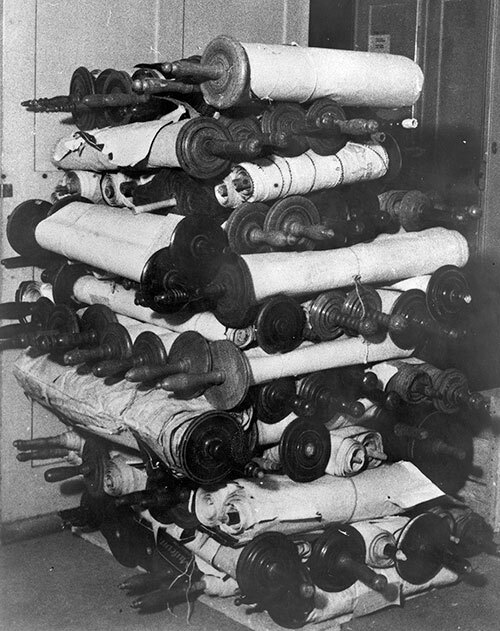 The smuggled documents joined another remnant of the Vilna YIVO; what the ERR selected for shipment to Germany had remained intact and was discovered by the Allies near Frankfurt after liberation. Thanks to the energetic efforts of Max Weinreich, YIVO’s only surviving leader, 420 crates of material arrived in New York in July 1947. The museum in Vilna that Kaczerginski, Sutzkever, and Kovner had established was closed, along with other Jewish institutions, in 1949. Its holdings were transferred to other repositories and disappeared from sight for the next 40 years. a staff member brought in a handcart with five brown paper bags wrapped with string. The staff member unwrapped them and took out documents written in Hebrew letters. Norich and his archivist were speechless. . . . Many of them bore YIVO’s stamp. This, they realized, was a portion of YIVO’s prewar Vilna archive. Negotiations commenced with Lithuanian authorities to regain possession of the materials, but they were ultimately unsuccessful. Instead, beginning in 1995, the archival documents were brought to New York, where they were duplicated and then returned. The final chapter of this story is still being written. In 2015 YIVO reached an agreement with the Lithuanian Central State Archives and the National Library of Lithuania to catalog and digitize the surviving Jewish materials in Vilna. As work proceeded new caches were discovered, revealing that more prewar documents remained intact than anyone had previously imagined. New resources are now available online, ensuring that the Vilna treasures will be preserved, made accessible, and reunited virtually with YIVO’s New York collections. The heroes of The Book Smugglers deserve no less. Cecile E. Kuznitz is the director of Jewish studies at Bard College, where she is a professor of history. She is the author of YIVO and the Making of Modern Jewish Culture: Scholarship for the Yiddish Nation (Cambridge University Press). 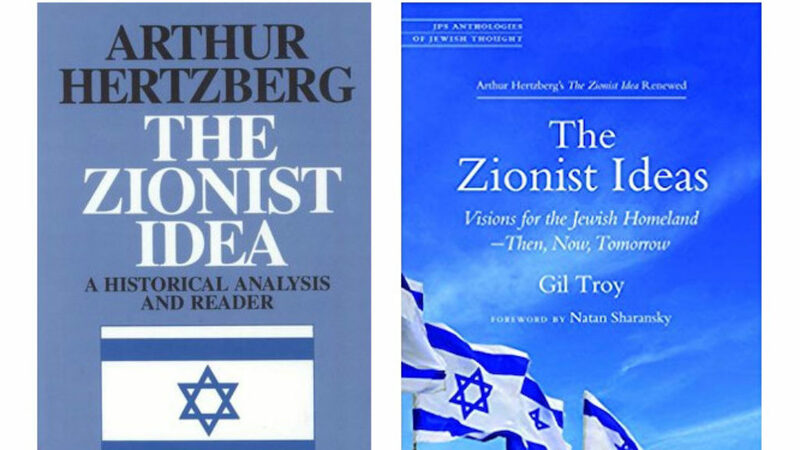 Gil Troy and Allan Arkush on Troy’s new book, The Zionist Ideas. How did a high-school dropout named Leon Uris pen one of the most influential novels of all time? It may come as a surprise that there is an entirely different Catskills, a Catskills that doesn't involve Grossinger's, bungalow colonies, or Jews, in the words of Billy Crystal, eating "like Vikings." Jay Solomon traces decades of spy games between the United States and Iran, a conflict, he writes, “played out covertly, in the shadows, and in ways most Americans never saw or comprehended."